Should a Mental Health Consultant Be Added to Support the Crisis Team for the Commerce City Police Department? Although Commerce City is relatively small in comparison to many other cities, it recently has been challenged with an increase in serious crimes. According to a 2018 survey, Commerce City has a crime rate which is 28% higher than the national average. (AreaVibes) The widespread use of drugs nationally, regionally, and locally has not only contributed to the crime rate but also has been attributed to the increase of people experiencing mental health crises. With CNT’s drastic increase in callouts, should a mental health professional be added to the team to assist them in the goal of obtaining peaceful resolutions? If so, CCPD and the community would most certainly benefit. Most CNT and SWAT team callouts involve hostage situations. 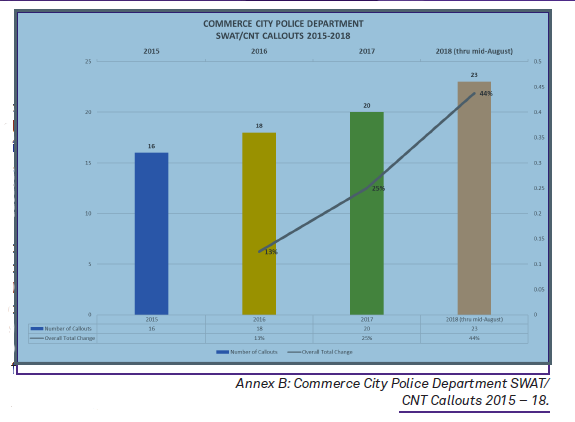 Callouts for the CCPD’s CNT and SWAT team will continue to increase. SWAT / CNT callouts will remain low-frequency, high-risk events that can result in civil litigation. Addition of a paid mental health professional as a CNT consultant will not result in a financial burden to the department. The cost is negligible compared to the added benefit of an on-scene licensed mental health professional providing guidance. Commerce City, CO, is spread over 35 square miles. Although its physical size has not changed, the number of people moving into Commerce City has nearly tripled since 2010, with nearly 56,000 residents now calling it their home. (World Population Review). The CCPD CNT is comprised of six members and supervised by a non-operational team leader. The officers on the team also are assigned to various sections of the police department, with CNT membership an ancillary duty. 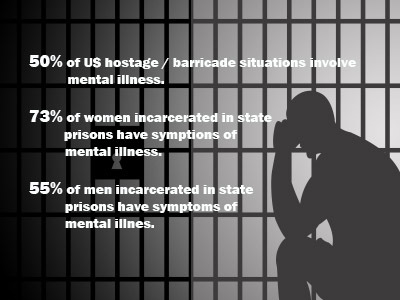 The documented pervasiveness of suspects suffering from a mental health issue with which hostage and crisis negotiators are forced to deal, coupled with the lack of advanced mental health education by any CNT member, should cause CCPD leadership to explore adding a mental health professional to the CNT. Data on CNTs currently utilizing mental health professionals on their teams are limited. An article published in Behavioral Sciences and the Law in 1993 included details from a survey of 300 law enforcement agencies. The survey reported that 39% of those agencies used a mental health professional as part of their CNT. Given the passage of 25 years since this publication and the documented prevalence of suspects with mental health issues, it stands to reason that the percentage of mental health professionals included on CNTs is now much higher. In researching various publications, websites, and best practices, the general consensus is that the mental health professional assigned to the CNT does not conduct the negotiation. (Fagan) If they are not actively negotiating, what function does the mental health professional serve? The strength of mental health professionals lays not in what they say to the suspect but in the support they provide to the CNT. Licensed professionals are used to educate CNTs on suspects’ potential mental health conditions and to provide strategies that CNTs can utilize to help bring incidents to peaceful resolutions. They also have the ability to access medical records, including mental health records, that HIPPA prevents police from accessing. In addition to providing communication ideas, these professionals can provide assessments on suspects’ potential risk for violence or suicide. They also can help monitor the CNT members’ stress levels and give a critical-incident stress debriefing at the conclusion of the event. (Young) Another tremendous benefit of having a mental health professional assigned to the CNT is that their expertise and perceived neutrality is valuable should the negotiation turn negative or result in an officer-involved shooting. When such an incident is publicly reviewed, the presence of a licensed professional to offer an expert opinion is often given more consideration by the general public over statements made by police spokespeople. Some mental health professionals may consider serving as a consultant for a police department on a pro bono basis. The Las Vegas Metropolitan Police Department has used four different psychologists as consultants on their CNT for more than 10 years. None of them charged for their services. Each indicated that the experience and exposure they received by donating their time on these callouts was a personal and professional benefit. In the event a mental health professional, whether a psychologist or licensed clinical social worker (LCSW), can not be located on a pro bono basis, the salaries for local psychologists in the area were examined. A review of three major organizations revealed the average hourly rate currently is $43.70. (ANNEX D) This is less than the overtime callout rate of an event CCPD CNT member. Based upon the research obtained in this study the consideration for adding a mental health professional to the CCPD CNT should be reviewed. Three possible solutions will be discussed. Option I: Maintain the status quo. No impact is made to the budget. No changes to the team structure are needed. Prevents the addition of a licensed mental health professional. Inhibits the professionalism of the CNT. Increases the potential for agency liability. No additional cost to the department. Option II: Attempt to locate a psychologist or LCSW who is willing to provide pro bono services for the CCPD CNT. They would respond to callouts, provide consultation, and assist the team with training. The addition of a licensed mental health professional would add to the resources available to the team, enhance the team’s professionalism, and increase the team’s credibility. Receiving pro bono services would allow for the addition of the licensed professional without the agency spending money. The mental health professional can provide needed training and monitor CNT members, without the agency paying additional funds. The number of mental health professionals willing to provide services for free will certainly be lower than those who have the desire to be paid. Many times, the adage “you get what you pay for” is sound advice. To obtain the services of quality mental health professionals will likely result in paying a fee for their services. By simply advertising for pro bono work, often “beggars cannot be choosers”, as we can only select from those who apply. Option III: Advertise the position on several professional websites, including Indeed.com. The pool of prospective mental health professionals interested in the position will expand. By making the mental health professional a paid consultant, the agency has more control of their activities at the scene. The addition of a licensed professional would add to the resources available to the team, to its professionalism, and to its credibility. A mental health professional can provide needed training and monitor CNT members, details of which can be written into a contract. An added expense to the police department. Potential of the public viewing the mental health consultant as a police employee. This option is the only one which would impact the agency’s budget. With the average hourly rate for Denver, CO, psychologists at $43.70, it would be reasonable to advertise the position to start at $50 per hour. With the average time of a callout being four hours, it would equate to $200 per callout to add the mental health professional to the team. Based upon the research presented in this study, it is in the best interest of the CCPD to advertise and recruit for a mental health professional for the CNT. This study has presented three possible alternatives for consideration. Option 1 is to maintain the status quo. This alternative will not address any of the issues facing the CCPD CNT nor will it allow for the team to receive the documented benefits. Option 2 is to attempt to locate a mental health professional who is willing to serve as a pro bono consultant. This is a viable option as it has worked for other agencies. The difficulty with Option 2 is that it limits the number of prospective candidates. Given the importance of this role, along with the relatively low cost involved ($50 per hour), Option 3 provides for more, and potentially better, candidates. $50 per hour x 4-hours per average callout = $200. $200 per callout x 30 callouts = $6,000 per year. Feldman, Theodore B., MD. (2004, Dec 4). The Role of Mental Health Consultants on Hostage Negotiation Teams. Psychiatric Times. Retrieved from http://www.psychiatrictimes.com/addiction/role-mental-health-consultants-hostage-negotiation-teams. Monte, Andrew A., MD, Richard D. Zane, MD, and Kennon J. Heard, MD, PhD. (2015, Jan 20). The Implication of Marijuana Legalization in Colorado. JAMA. 313(3):241-242. Retrieved from https://jamanetwork.com/journals/jama/fullarticle/2022370. 1 Unless otherwise noted, all annexes in this article are available through this link.